Coming soon to Megatronix Mobile Media…. Looking to throw the ultimate Tailgate Party in Beaumont, Port Arthur, The Golden Triangle or Southeast Texas? 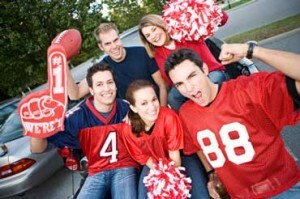 Megatronix Mobile Media will transform tailgating into an unforgettable event! It’s the best tailgate party idea in Southeast Texas! First, we bring our limousine styled video game theater to your home or even to the parking lot of the big game! Inside, we provide stadium seating for 30-35 with the best sound systems on the market and 7 60″ 4K TV’s. Two additional TV’s (dependent on weather conditions) outside allow 32-50 to play at once! Watch the Big Game Outside and Game away inside! Our rig is equipped with a high-definition satellite dish that gets the very best sporting events. We can display that game on one or all of our TV’s…it’s all up to you! And because it’s HD/4K (where games are available), you get that living room feeling while making it a tailgate at the same time. We’re self-powered and fully climate controlled, so we can go almost anywhere and keep your guests comfortable! Before, during and after the big game, you and your guests can play the latest multiplayer video games on our multiple XBOX One, PlayStation 4, Nintendo Switch and WiiU consoles! Worried about video game ratings? Don’t! We understand the importance of providing appropriate games for your party. When you book your party, you select games for your guests. You don’t need to worry or compromise; it’s our policy. We serve Southeast Texas in a 65-mile radius from Beaumont! We service Jefferson County, Jasper County, Hardin County and Orange County including the communities of Beaumont, Lumberton, Vidor, China, Sour Lake, Nederland, Evadale, Port Neches, Silsbee, Nome, Kountze, Mauriceville and Orangefield. See our Service Area for more information! And best of all, with Megatronix Mobile Media, there’s no stress and no mess! We make having your next tailgating event almost effortless. We bring the party right to you and you DON’T HAVE TO LIFT A FINGER!